Why are preventive maintenance plans so important? And why should I purchase one? Residential & commercial heating and cooling systems are very expensive to replace and to operate if regular maintenance is not performed on them. Would you let your car go without an oil change for three years or wear your clothes for a year and not clean them? We know what would happen if your car breaks down or your clothes become too filthy to wear. Both will require complete and expensive replacement. Our residential & commercial preventive maintenance plans cover heating and cooling systems. 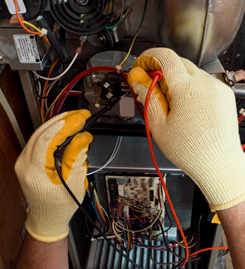 We perform annual or semi-annual maintenance , as well as routine HVAC services. Our preventive maintenance plans cover repairs and the cleaning of your HVAC system, and there’s no need to worry about extra cost after the inspections are completed. We will repair any problem we find during our annual preventive maintenance service. All aspects of preventive maintenance are done on HVAC equipment and systems: filter changing, cleaning, boiler flushing, water treatment, safety checks, thermostats, and gas valves. We will repair or replace any component associated with the equipment for normal operation if it fails. Our service at Sims Preventive Maintenance covers inspections, maintenance, and repair, all under one monthly and affordable cost.